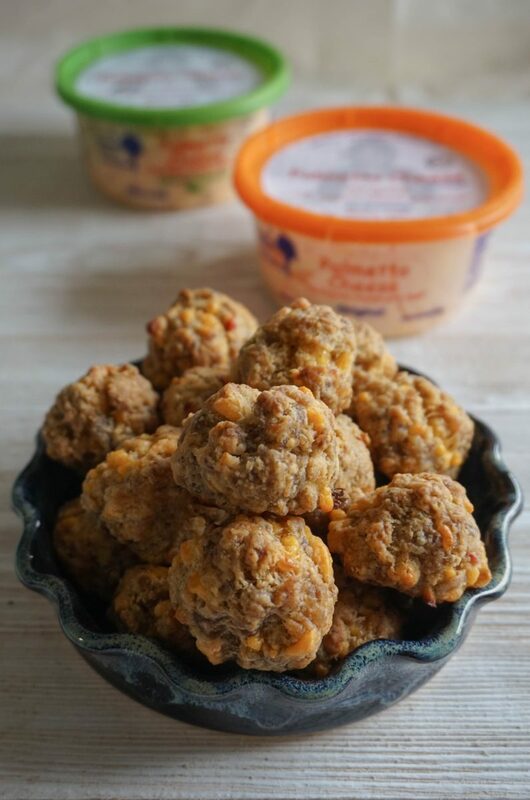 Pimento cheese sausage balls are a match made in heaven. I mean really, what could be better than two of my favorite Southern snacks rolled into one bite? I make my own pimento cheese a lot, but for this sausage balls recipe, I knew I needed something a little different, with a little more moisture that would mix well. So I went straight for Palmetto Cheese: the pimento cheese with soul! Palmetto Cheese was first made in the 90s by a lady named Sassy Henry. She and her family moved to South Carolina in 2002 and took over a local inn, where they served her pimento cheese as an appetizer. Before too long, it was a guest favorite, and a cook and family friend at the inn began making it in larger batches for guests to take home. In 2006, Palmetto Cheese was introduced into local market outlets. 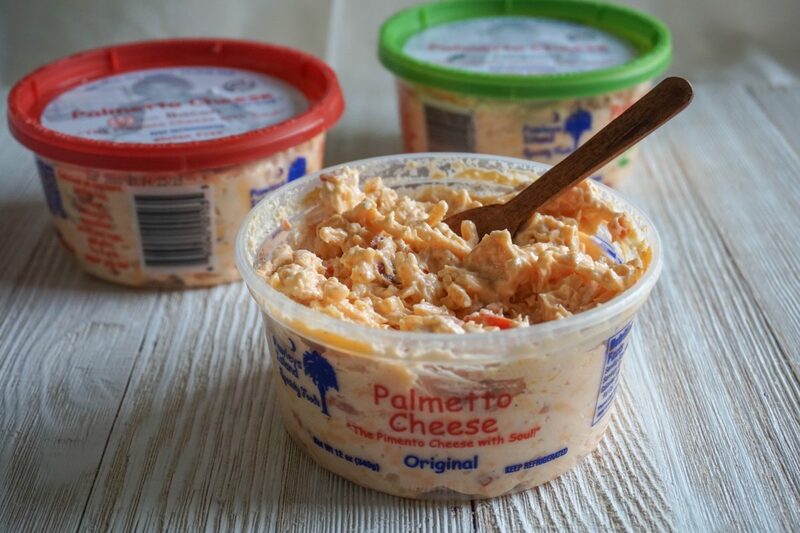 Now, you can find Palmetto Cheese in more than 9,000 locations in 49 states. Palmetto Cheese comes in 12-ounce tubs, a 20-ounce tub (original recipe), and 2-ounce snack packs. Though sometimes if I’m not careful, the 12-ounce tub becomes a “snack size.” Oops. I can’t wait to try the other flavors in other snacks and recipes. They also recently added a Chicken Salad to their collection, which makes a really tasty sandwich! Fun fact: I have family in Pawleys Island, S.C.! It’s a really lovely area. 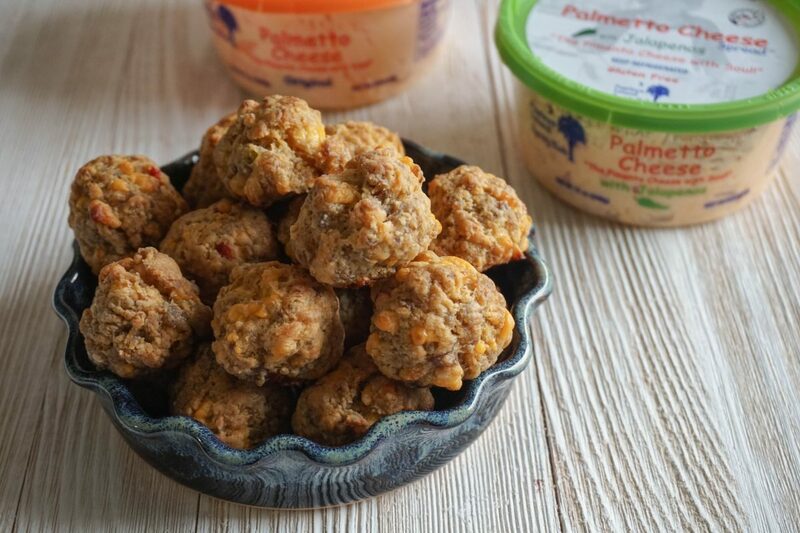 For this pimento cheese sausage balls recipe, I used two different kinds of Palmetto Cheese pimento cheese: the original, and the Jalapeño for some spice and kick. I almost went full-on with the Jalapeño, but thought blending with the original would mellow it out and balance well with my sausage. These pimento cheese sausage balls are a little bigger than my other sausage balls, because there’s a little more moisture in them from the pimento cheese. They’re super soft and fluffy, though, and always the perfect bite for a party, picnic, or tailgate. Here’s my recipe for Pimento Cheese Sausage Balls. It’s super easy and makes plenty for sharing. If you don’t eat pork, you can substitute turkey sausage. It works just as well! If you’re using turkey sausage, add 1-2 tbsp oil to make up for the fat. Also, the sausage is easier to work with if it’s not super cold. Add sausage and pimento cheese to a large mixing bowl. Mix to combine. Add Bisquick and spices (if using). Knead with hands until it’s all combined into a large ball. Scoop and roll into 1-inch balls. Place balls on a baking sheet lightly sprayed with cooking spray, or lined with a silicone baking mat. You can keep them closer together since they don’t spread. Bake for 15-18 minutes, until they’re golden brown on top. Store in air-tight container or zip-lock bag in the refrigerator for up to a week. What’s your favorite picnic or tailgate snack?